A Wall Clock can be a great feature in pretty much any room, whether it’s in your home, office, or perhaps a waiting room. They’re not only useful as a timepiece, many Wall Clocks are very decorative and make a nice addition to your décor. Some designs are fascinating and will always be a great talking point. Contemporary Heaven specialises in clocks of all types and sizes, and we have a fantastic variety of Wall Clocks large and small for you to choose from. Many of our clocks are manufactured here in the UK by Roco Verre, our parent company, and others come from such well-known manufacturers as Umbra, Invotis, and Koziel. Take a look around www.contemporaryheaven.co.uk and you’ll no doubt find the perfect Wall Clock, either for you or for someone you know. Coming in at a whopping 85cm in diameter, this beautiful circular mirrored Wall Clock is made by Roco Verre and is exclusive to us. Manufactured by hand in the UK and equipped with a high-quality German movement for great timekeeping, this Wall Clock is sure to make a statement on any wall. It has dual functionality, doubling as a mirror as well as a clock, and it reflects light constantly adding ambience and life to any location. Smaller sizes are also available if you need something a little more subdued. The clock requires 1 x AA battery. We absolutely LOVE this clock, and a quick look will show you why. It’s different, it’s fascinating, and it’s extremely eye-catching. If you want a clock that will attract attention from your guests and visitors, this is probably the one for you. The Wall Clock comes in black and has bold white numbers. The gears spin slowly round, turning the large gear, which tells the time. 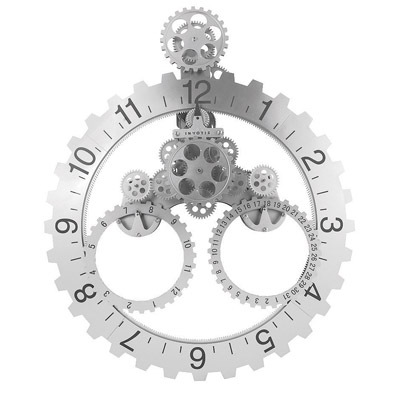 Slightly different to our other geared Wall Clocks, this model has two extra cog dials for the day and the month. Made by Invotis the clock requires 2 x D size batteries that are not included, and a very small amount of assembly will also be required. We get great reviews for this clock. James said… “a great and interesting clock that is always commented on by friends and visitors” whilstClaire told us… “It’s unique looking and a centre piece for any home”. We have a myriad of other Wall Clocks available, so have a good look around the site or use the search bar to search for Wall Clocks then you can find something to suit you.